We spent a total of 10 months in the USA visiting over 30 states and countless amazing places. It’s such a cheap and easy place to travel that we thought we’d share our 12 best tips for budget and comfortable travelling in the land of the stars and stripes. Most Walmart stores countrywide (and we’re talking thousands of stores here) allow RVs and campers to camp for a night or two in their carparks. The best part is that you’ll have the security of their cameras and security cars protecting you and you’ll even manage free WiFi if you park close enough to the store. Working in the van on a cold night parked at Walmart. Many Walmarts are also 24 hours which means free bathrooms whenever you need (which means a lot to someone who lives in a van). Any town in the States, no matter how small, most likely has a Walmart, which gives you peace of mind knowing that there’s always somewhere secure to park for the night. Even if you never once use your membership to go for a workout you’ll still get value out of Planet Fitness if you live in a van or car. For $20 per month you and a friend can have unlimited showers and access to massage chairs and beds at any Planet Fitness gym in the country – a road trippers paradise! You’ll also get free WiFi, free pizza (first Monday of the month), free bagels and coffee (first Tuesday of the month), free gym use and access to bathrooms whenever you need it. Best investment ever! Eating nachos that we cooked in our 12 volt slow cooker. Although eating out in the US is relatively cheap compared to Australia and Europe, being able to cook your own food will keep your costs down and your body healthy. Fast food is cheap – but buying groceries at Walmart or Aldi (super cheap German chain) and cooking for yourself will turn out a lot cheaper. Check your receipt for free food offers. Everywhere you go in the US you’ll find fast food chains galore – there are so many different franchises doing everything from burritos to burgers, BBQ to cheesecake that you’ll most likely find something you’ll like. Most fast food restaurants are relatively cheap – some of our favourites are Chick-fil-A (average meal $6), Steak n’ Shake (24 meals under $4) and Bojangles (average meal $6). But there’s a way you can get the same food for free! Many chains offer free food for filling out online surveys – all you have to do is answer a few questions about how the food and service was and you’ll get a free chicken sandwich (Chick-fil-A), milkshake or hamburger! Although hitchhiking isn’t as common as it used to be, the internet is a great place to find like-minded people who’re looking to do a road trip but don’t have the vehicle. Sites like Criagslist and Share Your Ride are great places to find others who you can become temporary travel buddies and help out with fuel costs. Just make sure you meet them before the trip and follow your gut when choosing who to share your car with. After travelling in the US for so long we found that McDonald’s and Starbucks are the best spot to use the internet. There’s always free parking, a spot to sit down and, usually, fast WiFi and power points. Grab a $1 cold drink or coffee and catch up on everything online! Most other fast food restaurants and even supermarkets also offer free WiFi. We’ve seen diesel prices vary from $3.96 a gallon to $2.09 a gallon right across the street. As fuel is our biggest cost on the trip, downloading the free app GasBuddy has been extremely helpful. GasBuddy shows you the cheapest fuel near you. The app shows you on a map or in a list the cheapest fuel options around you. When you select the petrol station you’d like to go to it will then navigate you there using Google Maps. The information is updated by users so may not be 100% up-to-date. However, the app shows you when the last price was updated and, so far, we haven’t found any incorrect information at all. For those who live in the US or are doing an extended trip cross country its likely that you’ll pass by a heap of National Parks. These are spots you can’t miss – but they can be pricey to enter. Everglades National Park, for example, charges $25 per car, per day to enter. If you’re going to be going to multiple parks however, the cheapest way to do so is by buying an annual pass. The pass costs $80 but will allow you entrance to any National Park in the United States for an entire year – and you can stay as long as you like in each park. We plan to visit the Everglades, Grand Canyon, Death Valley, Yosemite, Zion, Glacier and Moab National Parks among others so didn’t think twice about buying the annual pass. Hundreds of supermarkets, petrol stations and malls (including Walmart) have one of the above red boxes on premises. The aptly named Redbox allows you to rent DVDs, Blu Rays and video games from just $1.50 per day! We love pulling into our Walmart spot for the night, doing our teeth in the store’s restrooms and then renting a DVD to watch in the van. In the morning we can return it when we go to use the bathroom again or, if we forget, you can return any DVD to any RedBox kiosk country-wide. If you prefer going to the cinema then don’t fret either – we’ve found tickets for as low as $1.75!! Don’t believe us? Check out the photo above. Cinemas like Picture Show and Regal Cinema offer ultra cheap tickets on Mondays, Tuesdays and during the day. These shops are quite different to the dollar stores back home as they also have a very big variety of groceries and home products. You can buy fruit and vegetables, dairy, processed meats, bread, crackers, chocolate, packaged items, toiletries and cleaners all for under a dollar! The price tags are unbelievable – Pringles for .99c, Philadelphia cream cheese for .99c and a lot of different fruit and vegetables all for crazy cheap prices! Check out what we mean in the video above (click CC at bottom right for English subtitles)! You can find a heap of discount tourist attractions, restaurant deals and activities to do on these sites. 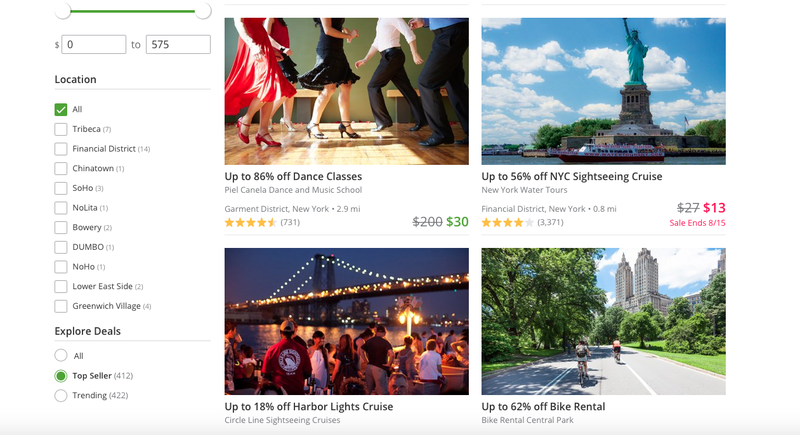 I popped ‘New York activities’ into Groupon and the above options (plus many more) came up. If you’re looking to do activities or tourist attraction in a certain place check these sites out first before paying full price. You’ll save an arm and a leg and even find out interesting things to do that you didn’t know about before. 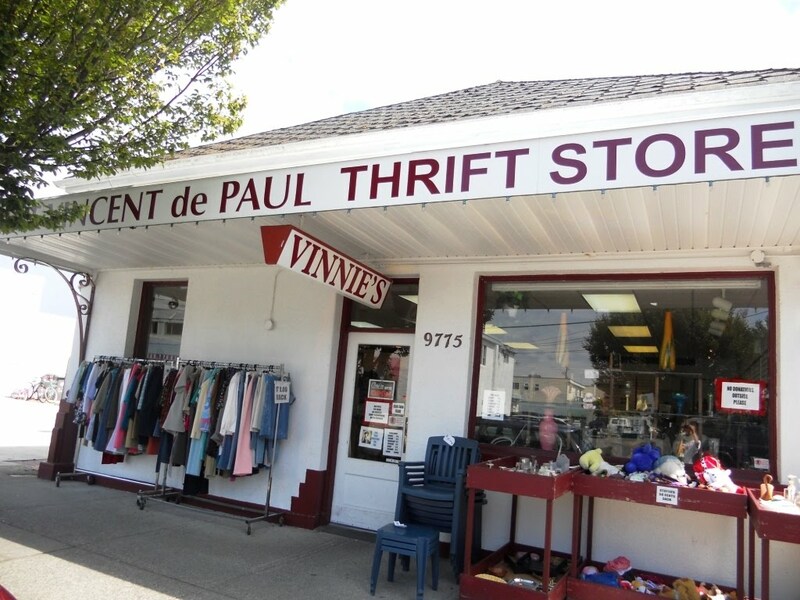 Thrift shops (or op-shops/secondhand stores) are EVERYWHERE in the USA. Not only do most have a great range of clean clothing, near-new household goods and books/toys but it’s all super cheap and you’ll most likely be helping the local community by buying here. Many thrift stores employ disabled locals and put their profits towards community-based projects. We bought many things at thrift stores including cold weather gear when winter came – snow boots for $5? 100% marino wool cardigan for $3? Yep.. we got all the deals! Do you have any other cheap hacks for the USA? Leave a comment below, we’d love to hear form you!